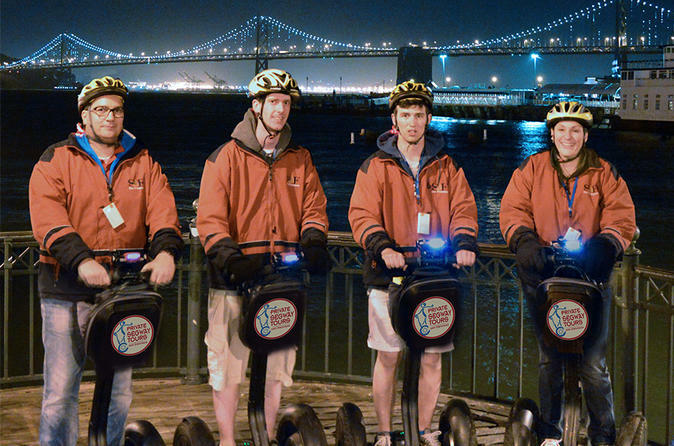 Combine the fun of touring San Francisco by Segway with the personal touch of having a private guide attentive to your group’s interests and skills featuring Chinatown at night. You’ll be able to cover more ground than walking and enjoy the fun of the Segway personal transporter for a once-in-a-lifetime experience while touring San Francisco! Riding a Segway is intuitive, like bike-riding, but it takes a moment to learn how to operate it. You'll have 20-25 minutes of Segway training before beginning your tour, so that you become comfortable riding the most innovative transportation of the millennium. You will practice until your group feels familiar with the Segway, then be ready to tour San Francisco! Once you’re rolling, you’ll follow your guide along the streets of San Francisco on a 3-hour tour, with the ability to cover more distance than on a typical walking tour and plenty of opportunities to stop for photos and questions along the way. You’ll have more time than on the regular public tour, and your guide will be able to adjust the itinerary and pace to your group’s interests and skills.